Our Managing Director, Scott is responsible for all McLeod business operations. A leader in business systems development, he is also directly responsible for our Tauranga operations and Health & Safety. In this last role, he led McLeod to winning the 2012 New Zealand Small Business of the Year Initiative in Health & Safety and a finalist position in 2013, 2014 and 2015. Scott's background includes crane operation and dispatch, computer programming, electronics and ex-RNZN - commissioning crew HMNZS Te Kaha. Scott is also the Immediate Past President of the Crane Association of New Zealand - indicative of his passion for the New Zealand crane industry becoming world leaders in safety priorities. General Manager of McLeod Hiabs having been in the transport industry for almost 20 years, during which time he has owned and operated his own businesses. Having done so, has provided Phil with an outstanding level and quality of practical, results-focused industry knowledge and experience. In a past life Phil spent 9 years as Regional Manager for NZ's largest truck & trailer rental and lease business, TR Group, and 7 years as Transport/Branch Manager for Mainfreight Transport. Phil focuses on creating strong customer relations and getting the job done right the first time. hiabs@mcleod.nz or cranes@mcleod.nz or by phoning 0508 McLeod. Roger joins the team from Auckland Cranes. Roger brings a huge wealth of experience to the team having previously worked in the Auckland crane industry for many years. As a Site Operations Manager, Roger is responsible for crane movements and project logistics along with site inspections. At McLeod Roger is responsible our Kawerau operations, concrete panel projects and drilling rig logistics. As an operations supervisor John works with our clients to plan and manage day to day operations on drilling site. Valuably John has extensive experience in crane operations having spent many years operating some of the biggest cranes in the industry. Brian joined the McLeod team in 2016 with experience in logistics and account management. He has since moved into an Account Manager role with a strong focus on customer relationships and strives to exceed our customer expectations to ensure working with McLeod is an easy and pleasant experience. Dean fulfills the demanding role of Tauranga Operations Manager. As such, he is often our customers' first point of contact with McLeod, and well able to advise and guide on selecting the right crane for the job. Usefully too, Dean has previously worked as a site engineer - so has been on the other end in ordering cranes. It means he understands relevant requirements thoroughly, and the importance of getting the right machine first time. Andre joins the team from Rotorua with 20 years' involvement in the heavy transport industry. He brings a wealth of experience having previously worked in the crane industry in both Tauranga and Rotorua. Andre is responsible for crane movements and project logistics along with site inspections. He is committed to 100% customer service satisfaction. Alex is a new manager having previously operated mobile cranes up to 130 Tonne. With McLeod Alex often manages large geothermal drilling rig moves around the Central Plateau. As a Taupo local we are proud to have him as part of our tea,. Alex works with our customers in the field to ensure every project meets our high standards. Our customer-facing operations depend on thorough, reliable and highly responsive internal management. McLeod is fortunate in the commitment and capability available in Lynda, who manages financial processes for the business and our customer accounts. Valuably, Lynda has owned and run her own successful company in the past, so knows the requirements of efficient, effective management, and the demands of team building and support. Together with her admin team, she provides a secure administrative base for the company. 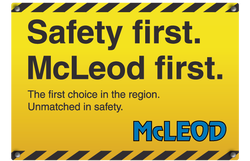 McLeod lead the industry in Health, Safety and Environmental systems and processes. Michelle is critical to ensuring the Check and Change cycle of Plan, Do, Check and Change is working and the bench mark McLeod is setting is pushed forward. Michelle holds a Diploma in Occupational Health and Safety (Level 6). Rich has over 15 years' experience in the automotive industry. He is responsible for Fleet Maintenance and Compliance. He also has a central role in managing regulatory requirements, with permits and crane certificates, and assisting mechanically with our rigorous plant maintenance procedures. The art of Human Resources is performed by Jacqui using her unique skill to look after our people. Jacqui ensures our team are walking the walk from Management and Dispatch to the Shop Keepers or Operators looking after our customers with our cranes and hiabs. Jacqui has over 10 years of experience in recruitment and HR.